In Christian churches with episcopal polity, the rank of metropolitan bishop, or simply metropolitan, pertains to the diocesan bishop or archbishop of a metropolis. Originally, the term referred to the bishop of the chief city of a historical Roman province, whose authority in relation to the other bishops of the province was recognized by the First Council of Nicaea (AD 325). The bishop of the provincial capital, the metropolitan, enjoyed certain rights over other bishops in the province, later called suffragan bishops. The term is applied in a similar sense to the bishop of the chief episcopal see (the "metropolitan see") of an ecclesiastical province. The head of such a metropolitan see has the rank of archbishop and is therefore called the metropolitan archbishop of the ecclesiastical province. Metropolitan (arch)bishops preside over synods of the bishops of their ecclesiastical province, and are granted special privileges by canon law and tradition. In some churches, such as the Church of Greece, a metropolis is a rank granted to all episcopal sees. Their bishops are all called metropolitans, the title of archbishop being reserved for the primate. In the Latin Church, an ecclesiastical province, composed of several neighbouring dioceses, is headed by a metropolitan, the archbishop of the diocese designated by the Pope. The other bishops are known as suffragan bishops. serving as the default ecclesiastical court for appeals from decisions of the tribunals of the suffragan bishops. The metropolitan also has the liturgical privilege of celebrating sacred functions throughout the province, as if he were a bishop in his own diocese, provided only that, if he celebrates in a cathedral church, the diocesan bishop has been informed beforehand. The metropolitan is obliged to request the pallium, a symbol of the power that, in communion with the Church of Rome, he possesses over his ecclesiastical province. This holds even if he had the pallium in another metropolitan see. It is the responsibility of the metropolitan, with the consent of the majority of the suffragan bishops, to call a provincial council, decide where to convene it, and determine the agenda. It is his prerogative to preside over the provincial council. No provincial council can be called if the metropolitan see is vacant. 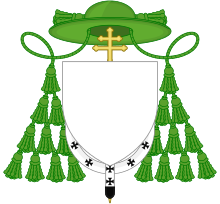 All Latin Rite metropolitans are archbishops; however, some archbishops are not metropolitans, as there are a few instances where an archdiocese has no suffragans or is itself suffragan to another archdiocese. Titular archbishops (i.e. ordained bishops who are given an honorary title to a now-defunct archdiocese; e.g. many Vatican officials and papal nuncios and apostolic delegates are titular archbishops) are never metropolitans. As of April 2006, 508 archdioceses were headed by metropolitan archbishops, 27 archbishops lead an extant archdiocese, but were not metropolitans, and there were 89 titular archbishops. See also Catholic Church hierarchy for the distinctions. In those Eastern Catholic Churches that are headed by a patriarch, metropolitans in charge of ecclesiastical provinces hold a position similar to that of metropolitans in the Latin Church. Among the differences is that Eastern Catholic metropolitans within the territory of the patriarchate are to be ordained and enthroned by the patriarch, who may also ordain and enthrone metropolitans of sees outside that territory that are part of his Church. Similarly, a metropolitan has the right to ordain and enthrone the bishops of his province. The metropolitan is to be commemorated in the liturgies celebrated within his province. A major archbishop is defined as the metropolitan of a certain see who heads an autonomous Eastern Church not of patriarchal rank. The canon law of such a Church differs only slightly from that regarding a patriarchal Church. Within major archiepiscopal churches, there may be ecclesiastical provinces headed by metropolitan bishops. There are also autonomous Eastern Catholic Churches consisting of a single province and headed by a metropolitan. Metropolitans of this kind are to obtain the pallium from the Pope as a sign of his metropolitan authority and of his Church's full communion with the Pope, and only after his investment with it can he convoke the Council of Hierarchs and ordain the bishops of his autonomous Church. In his autonomous Church it is for him to ordain and enthrone bishops and his name is to be mentioned immediately after that of the Pope in the liturgy. In the Eastern Orthodox Churches, the title of metropolitan is used variously, in terms of rank and jurisdiction. In terms of rank, in some Eastern Orthodox Churches metropolitans are ranked above archbishops in precedence, while in others that order is reversed. Primates of autocephalous Eastern Orthodox Churches below patriarchal rank are generally designated as archbishops. In the Greek Orthodox Churches, archbishops are ranked above metropolitans in precedence. The reverse is true for some Slavic Orthodox Churches (Russian Orthodox, Bulgarian Orthodox) and also for Romanian Orthodox Church, where metropolitans rank above archbishops and the title can be used for important regional or historical sees. In terms of jurisdiction, there are two basic types of metropolitans in Eastern Orthodox Church: real metropolitans, with actual jurisdiction over their ecclesiastical provinces, and honorary metropolitans who are in fact just diocesan bishops with honorary title of metropolitan and no jurisdiction outside their own diocese. Some Eastern Orthodox Churches have functioning metropolitans on the middle (regional) level of church administration. In Romanian Orthodox Church there are six regional metropolitans who are the chairmen of their respective synods of bishops, and have special duties and privileges. For example, Metropolitan of Oltenia has regional jurisdiction over four dioceses. On the other hand, in some Eastern Orthodox Churches title of metropolitan is only honorary, with no special or additional jurisdiction. In Serbian Orthodox Church, honorary title of metropolitan is given to diocesan bishops of some important historical sees (Article 14 of the Constitution of Serbian Orthodox Church). For example, diocesan bishop of the Eparchy of Montenegro and the Littoral is given the honorary title of metropolitan, but without any jurisdiction over other diocesan bishops in Montenegro. Diocesan bishop of the Eparchy of Dabar-Bosnia is also given the honorary title of metropolitan, but without any jurisdiction over other diocesan bishops in Bosnia and Herzegovina. Non-canonical Eastern Orthodox Churches generally use metropolitan title according to local traditions of usage in Churches from which they were split (see: Macedonian Orthodox Church). Metropolitan is a title used by all oriental orthodox churches in Malankara. Malankara Metropolitan was a legal title given to the head of the Malankara Syrian Church, aka Puthencoor (New Traditionalists) Syrian Christians, by the Government of Travancore and Cochin in South India. This title was awarded by a proclamation from the King of Travancore & the King of Cochin to the legal head of the Malankara Syrian Church. The Supreme Court of India had authenticated the usage of this title by the Malankara Orthodox Syrian Church in its verdict in the Malankara Church case. Baselios Mar Thoma Paulose II was enthroned as Catholicos of the East and Malankara Metropolitan on 1 November 2010 at Parumala, Kerala. Under his see, the dioceses are further headed by Diocesan Metropolitans. In the Mar Thoma Syrian Church which is based in India, the Metropolitan also known as the Mar Thoma is the primate and supreme head of the church who is entitled to special privileges and remains the ultimate authority over the synod. His Grace the Most Rev Dr. Philipose Mar Chrysostom is the senior metropolitan as of 28 August 2007, and His Grace the Most Rev Dr. Joseph Mar Thoma is the 21st Malankara Metropolitan and current primate, installed on 2 October 2007. In the Anglican Communion, a metropolitan is generally the head of an ecclesiastical province (or cluster of dioceses). In the few Anglican churches with multiple provinces headed by metropolitans (namely the Church of England, the Church of Ireland, the Anglican Church of Canada, the Anglican Church of Australia, and the Church of Nigeria), a metropolitan ranks immediately under the primate or senior metropolitan of the national church. Most metropolitans, but not all, are styled archbishop. In England, Ireland, and Australia, each province has a "metropolitical see" whose diocesan bishop is ex officio metropolitan (such as the Archbishops of Canterbury and Sydney), while in Canada metropolitans are elected by the provincial houses of bishops from among the sitting diocesans. Prior to 1970, however, the metropolitan of the Province of Rupert's Land was always the bishop of the eponymous diocese, centred on Winnipeg. (Since then, only one Bishop of Rupert's Land, Walter Jones, has been elected metropolitan). ^ Cross, F. L.; Livingstone, E. A., eds. (2005). "Metropolitan". The Oxford Dictionary of the Christian Church. New York: Oxford University Press. ISBN 978-0-192-80290-3. ^ Canon 1438 no. 1. ^ "Constitution of the Serbian Orthodox Church". Serbian Orthodox Church. ^ "MOC today". Macedonian Orthodox Church. Wikisource has the text of the 1911 Encyclopædia Britannica article metropolitan. "List of Catholic Metropolitan Archdioceses in the world". GCatholic.org. Herbermann, Charles, ed. (1913). "Metropolitan" . Catholic Encyclopedia. New York: Robert Appleton Company. This page was last edited on 12 March 2019, at 21:03 (UTC).